Young girl with a basket of flowers and young boy holding a bird's nest. Oil on canvas, each These are oil paintings set in elegant Louis XVI giltwood frames and copies after Drouais. Received into the Académie Royale in 1758, Drouais had already made a name for himself the year before with his double portrait of the Comte de Provence and Duc de Berry as Children (1757; Museu de Arte, São Paolo), in which the hallmarks of his style are already in place: a glossy, highly finished manner coupled with a meticulous rendering of sumptuous costumes and a sweet idealization of his sitters' faces. Drouais was at his best in the numerous sentimental portraits of the children of noble families in fancy dress, such as the Comte and Chevalier de Choiseul as Savoyards of 1758 (Frick Collection, New York), and the Comte d'Artois and His Sister Riding a Goat (1763; Musée du Louvre, Paris). The success of these paintings attests to the fashionable affectation of les grands to espouse the virtues of the simple rustic life. The present pair of paintings, which function as genre images, may well be portraits of an unidentified brother and sister in fancy dress. While they serve as charming depictions of childhood, their attributes -- the little boy capturing a resistant bird, the adolescent girl holding two pink flowers beside her budding breasts -- also relate to the long-standing tradition in northern art of employing children to allegorize awakening sexuality. A reduced, unsigned oval version (or copy) of the boy holding the bird, but against a plain background, is recorded in the photo files of the Frick Art Reference Library. See Christie’s Arts of France sale in New York, 2 November 2000, Lot 143 which sold for $248,000. Drawing of children playing besides a basin of water. 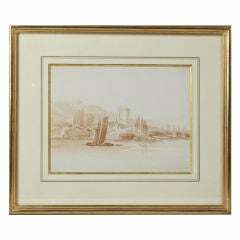 Framed in a Louis XVI giltwood frame. Typical of the style and subjects of Francois Boucher. Chalk and pencil on paper. Oil on canvas In the style of "Paysagiste" of the 19th century Could be compared to the style of a Barbizon School Gold finish frame. Pair of flemings Baroque oil on panel painting, 16th century. Fine art.